Title insurance is an insurance policy or contract issued by a title company it protects you, the purchaser or owner, against a loss that may arise by reason of a defect in your ownership or an interest you have in real property. In addition, the title insurance company agrees to defend you in court if there is an attack on your title. It will cover attorney and court expenses or pay a loss caused by a defect in title up to the face amount of the policy subject to the terms listed in your policy. HOW DOES TITLE INSURANCE DIFFER FROM OTHER TYES OF INSURANCE? Before issuing a commitment for title insurance, Guaranty Title Company of Boerne will check for defects in your chain of title by examining public records, including deeds, mortgages, wills, divorce decrees, court judgments, tax records, liens encumbrances and plat records. The title search determines who owns the property, what debts are owed against it and the conditions of the title. 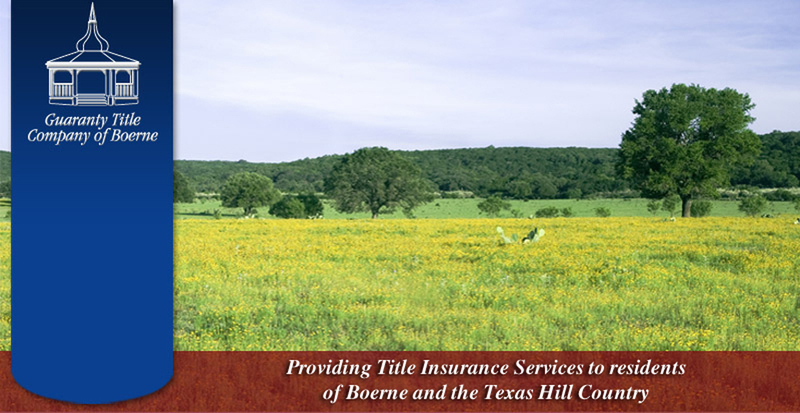 Guaranty Title Company of Boerne also handles the property closing and holds the earnest money in a trust account until the purchase is complete. Most lending institutions will not loan money for a home or other property unless you provide a "mortgagee" title policy. This policy protects the lender's investment by paying the mortgage if a title defect voids owner's/buyer's title. The new loan is often sold to an investor who requires the "mortgagee" title policy. When you buy a house, title companies also issue an owner's policy, unless you reject it in writing. HOW LONG SHOULD YOU KEEP YOUR POLICY? The owner's policy remains in effect as long as you or your heirs own the property or are liable for any title warranties made when the property is sold to your subsequent buyer. You should keep your policy, even if you transfer the title. Your owner's title policy cannot be transferred to a new owner. If the new owner wants an owner's title policy, there must be a new policy issued. IS MY POLICY STILL GOOD IF I REFINANCE MY HOME? Most lenders require borrowers to buy new mortgagee title policies when refinancing. When the new loan pays off the existing loan, the old Mortgagee title policy is no longer in effect. A new policy is issued in connection with the new loan. Title Companies must discount the premium if refinancing occurs within seven years of the original loan date.